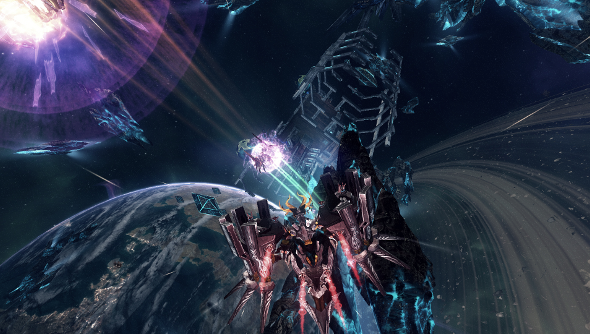 Flashy, hyperspeed-paced space shooter GoD Factory: Wingmen launched today on Steam. It’s a multiplayer affair with 4 v 4 matches and really bizarre, customisable space ships. Cooperation is essential – no Maverick or Hal Jordan nonsense here – and the combat’s tactical. Direct your eyes towards the brightly coloured launch trailer, below. Combat in space sure is pretty. The big old carriers the lovely little ships keep looking at are not as elegant or sleek, however, which is maybe why they keep being attacked. Space is very superficial. GoD Factory supports Oculus Rift shenanigans, too, so you can slap the dev kit on your face and pretend you’re ridding the galaxy of ships that aren’t as pretty as yours. Its up on Steam for £14.99/$19.99.